This is a book that grew out of the One Drawing a Day blog. There are 42 interesting daily exercises aimed at giving you ideas on what to draw, and encourages encourage exploration and experimentation. Some involves drawing simple subjects around the house, some encourages you to draw outdoors, drawing the nature or people at a cafe. The instructions are minimal but give you a good starting point to generate more ideas on things you can draw. The exercises require you to find a subject to draw, something you can see and use a reference, and not on conjuring ideas from imagination. The drawing style you can use are suggested by the exercises. We're not talking about realistic representational drawings but more on the loose and expressive. It's important to note that this is a mixed media book. There are lessons that require different materials, like charcoal, watercolour, crayon, bamboo pen, etc. If you don't already have them, it might be difficult to follow along. A lesson that requires using watercolour can't really be substituted with other materials without losing the point of the lesson. This is not a book for beginners with absolutely no idea on how to draw. You can be asked to draw portraits, and that requires observation skills that are taught not in the book. However, it's a fine book to pair with beginner drawing books. The ending gallery features the work of artists from Studio 1482, which author Veronica Lawlor is part of. Other artists includes Despina Georgiadis, Eddie Peña, Dominick Santise, Kati Nawrocki, Greg Betza, Michele Bedigian and Margaret Hurst. 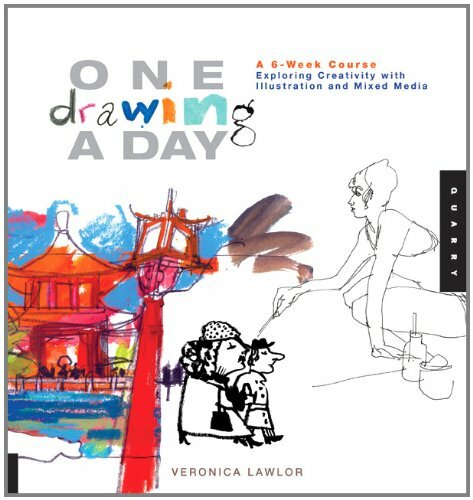 I'll recommend this book to those who want to keep their mind creative, and those who just want to have fun drawing.